In the frontal impact, the passenger compartment remained stable despite some separation of the facia cross-beam from the A-pillar. The steering column, the column shroud and the facia in the region of the centre console posed a potential threat of injury to the driver's knees as did the glove box lid to the passenger. Protection of the chest in the side pole impact was rated as poor, owing to the extent to which the ribs were deflected. In the side impact, the car provided adequate protection to the chest and good protection to the other body areas assessed. Protection against whiplash injury was rated as marginal. The Mazda 6 scored maximum points for protection of the 3 year old, based on the dummy responses in the dynamic tests and lost only a fraction of a point for the 1½ year old. The passenger airbag can be disabled to allow a rearward-facing child restraint to be used in that seating position. However, information provided to the driver about the status of the airbag is not sufficiently clear. The presence of ISOFIX anchorages in the rear outboard seats was not clearly marked. The bumper scored maximum points for the protection it offered to pedestrians' legs. The bonnet surface provided mostly poor protection in the area where an adult's head might hit and marginal protection in most of the areas likely to be struck by a child's head. 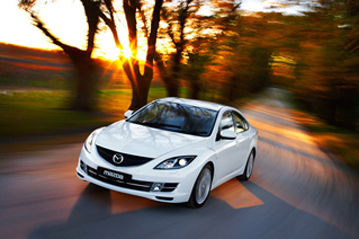 Electronic Stability Control is fitted as standard equipment on all variants in all countries. The Mazda 6 has a seatbelt reminder system for the driver, passenger and rear seats. However, the system for the rear seats did not meet Euro NCAP's requirements so the car was rewarded for the driver and passenger positions only.